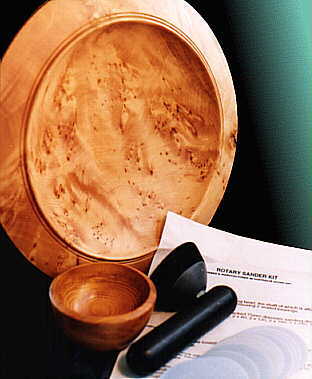 The small bowl and large platter used for the Rotary Sander demonstrations are seen here fully sanded and ready to be finished. Also shown is the Rotary Sander Kit comprising the sander plus 10 velour backed sanding discs and instruction sheet. Sanding discs can be replaced at any time for a minimal cost, especially if you are prepared to cut your own from velour backed abrasive sheets.